Commercial facial cleansing cloths can be very expensive. Here is an easy way to make your own. They can also be used as baby wipes & boo boo wipes. 1 container large enough to fit 1/2 a roll of paper towels. with a tight fitting lid. 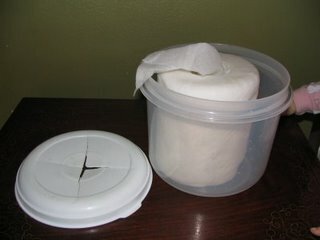 Cut an x in the top of the lid to feed the wipes through. or an empty baby wipe container or washed out empty commercial cleaner wipes contaner can be used too. With a serrated knife cut the roll of paper towels to form 2 short rolls. remove the center cardboard tubes. Place one roll into the plastic container. In a bowl mix the water, shampoo and oil well and pour into container. Close the lid to allow the towels to absorbe the liquid. 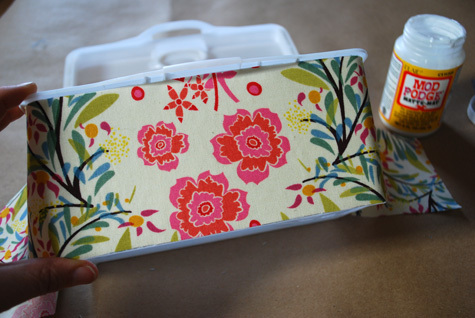 To use, pull a corner of the center sheet from roll through the opening in the lid. Looks like she modge podged some fabric around the container. Very cute.